How to exactly sync to the raster line for a vertical raster split? I ran into two problems here: In lines with badlines the VIC stuns the CPU during the time when the program should switch the screen mode. For that reason I skip the bad lines in above code, resulting in these horizontal lines. I tried to manipulate bits 0-2 in $D011 to surpress bad lines, but then the screen was not drawn properly. Is there a possibility to skip bad lines while still having a properly drawn screen? Second issue: When I start the program (e.g. by SYS 49152) I get a varying offset of some cycles from the actual start of a rasterline, because my busy waiting loop is 4+2 cycles long. This shows itself in the split line being shifted to the left or right, however within my program I don't know how to detect or correct this. Any idea how to remove this start jitter? Is there a possibility to skip bad lines while still having a properly drawn screen? This is absolutely impossible for character modes and at least problematic for bitmap modes. The additional cycles in a badline are needed for accessing the "video matrix", which is a 12-bit wide access of the "screen ram" (8bit) and the color ram (4bit). In character modes, without this access, you won't have any characters as their codes are stored in the screen ram. 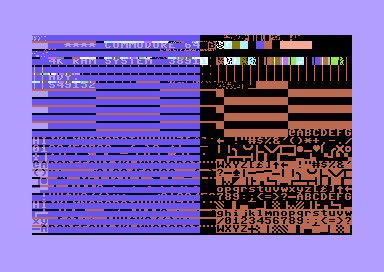 With bitmap modes, the video matrix holds color information, so you would at least need one badline to have anything other than "black on black". Without further badlines, the colors will stay the same in vertical direction for the whole screen. [exact raster position] Any idea how to remove this start jitter? There are a lot of possible approaches, and one possibility is to do exactly what you described in your self-answer. An easy way to avoid badlines with this method is to start inside the top/bottom border. Other options include the well-known "double IRQ" (have a second raster IRQ in a NOP slide, then remove the final 1-cycle jitter by checking when exactly the next raster line is reached), using slightly out-of-phase CIA timers, syncing with a sprite, and stabilizing by forcing a VIC-II DMA. 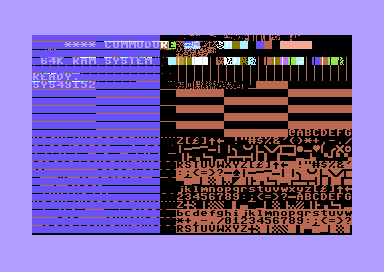 But, studying the VIC-II reference above, the first time the CPU is allowed to run again in a badline, you're already at horizontal raster pos $150, which is the last character column. Therefore, unfortunately, a "sensible" horizontal split isn't possible in a badline. Inspired by Raffzahn, I found a way to remove the jitter by waiting for a rasterline, then checking after 62 cycles if the next rasterline is already there, which would be an indication that could have detected the line earlier. After at most five iterations the earliest detection point is found. This only works if there is no badline during the tests, bit since a badline comes every 8 lines it is easily possible by waiting for a given line in order to start with badline-free horizon. This programm implements the algorithm and is to be run together with the code in the question. Note that the timing between the routines is also critical, so putting the routines directly together without the JMP $C000 would require some instructions to burn 3 CPU cycles. c121  CD 12 D0    CMP $D012 ;after 62 cycles, is the new rasterline already there? Not the answer you're looking for? Browse other questions tagged commodore-64 graphics or ask your own question. Can a Commodore 64 use two screenmodes on one scanline? How to obtain 256 arbitrary colors with limitation of 64 per line in Amiga (ECS)? How did the “rub joystick port to continue” in the Creatures 2 infinite lives cheat work? How to develop software for the Commodore 64 with VICE? How do CGA emulators for Hercules graphics work? How did the C64 interface tape drives? Can the Commodore 64 display 26 rows of text?